You know the feeling you get when you’re an overnight guest in someone’s home, and you awaken to a hot-off-the-griddle breakfast? Or when a coworker brings in a pan of her famous brownies to celebrate your recent promotion? Doesn’t it feel great when dinner at the neighbors’ house includes multiple courses of scratch-made recipes and conversation that lingers beyond dessert and that last cup of coffee? For many of us, these are the moments in which we feel most loved. That’s the idea behind The Loving Kitchen. Get your family’s day started right with LeAnn’s fluffy Pumpkin Spice Pancakes, or a bowl of Almond Coconut Granola and yogurt. Keep your favorite sports fans fueled through the entire game with hearty servings of Hot Sausage and Spinach Dip, or toss together a Grilled Chicken and Berry Salad for lunch with your dearest girlfriends. Want a signature dinner you can serve on those special occasions? Stuffed Pork Tenderloin with Orange Cranberry Glaze with Creamy Smashed Baby Potatoes is the perfect meal to celebrate a milestone. LeAnn’s sunny narrative and ideas for bringing people together will remind you that the best meal you’ll ever cook is the one you prepare as an act of love. If there is one thing this Mama loves doing for her family, it's cooking. It's one of the ways I show them love and just how much I care about them. I have to admit though, I've worried on occasion that my way of showing them love is actually the wrong way. Nonetheless, I sure do enjoy it! Now if you know me, you know I love me some Paula Deen. Butter, mayonnaise, gooey cakes and fried chicken sounds right up my alley. So I'm deffo not going to hate on the unhealthier recipes in this book. These recipes are easy to follow and my fam loved them! This book reminded me a lot of Paula. The tone of it is very down-home, which I loved. 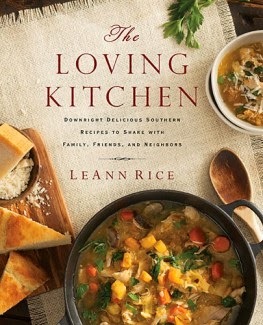 LeAnn shares her take on many Southern classics, like fried chicken, grits, BBQ, and sweet potatoes. Her writing style is casual and sprinkled with humor (and y'all know I love humor), like she’s talking to you right across the kitchen table. She makes you feel like you've known her forever. I don’t think I've ever been more excited about a new book. This will definitely be my go-to cookbook. What I loved the most y'all was the love and heart in this book. As I said above, I show love through cooking. In this book, I could feel the love and comfort that she associates with cooking for people. She gives the reader assurance that your meals don’t have to be perfect to show that love to your family. And I assured me that I'm not the only one that shows my love that way. Whew, no need to keep stressing over it.